David McDaid and Larne team-mates celebrate the striker finding the net against Crumlin Star. Pic by Pacemaker. 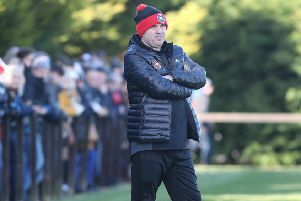 Larne boss Tiernan Lynch finished with victory on Saturday but accepted his players were made to ‘earn their crust’ as they eventually saw off Crumlin Star to make the quarter-finals of the Irish Cup. 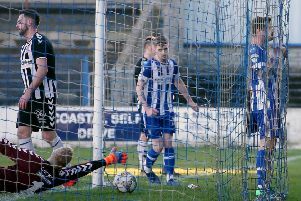 The runaway Bluefin Sport Championship leaders were a goal down in the opening stages - but hit back to win 3-1 and seal a date with holders Coleraine in the last eight. Joe McNeill celebrates his goal for Crumlin Star in front of supporters. Pic by INPHO. It will be a repeat of the semi-final clash between the sides last season, but at the weekend Lynch was just relieved to make it through. “We knew they were going to make us earn our crust,” Lynch said. “We have watched them and know how hard they work for each other and how they were going to make us work. “You always want to play better and score more goals, but I’m delighted with our professionalism and how we reacted to going a goal down. “The opening goal was a bit of a lesson for us, because we were down to 10 men with Shane McEleney off injured at that stage and we didn’t quite plug the gap. “Credit to Crumlin Star though, they came at us and got their goal. “I think our lads deserved credit as well, they didn’t panic. “We regrouped and got the equaliser and might have scored before then as well. Paul Trainor’s Amateur League side started strongly and took the lead on 13 minutes, courtesy of former Irish League midfielder Joe McNeill. He picked up brother Aiden’s ball on the edge of the area to fire past Conor Devlin, much to the delight of the large travelling support behind that goal. The shocked hosts composed themselves and began to dominate, drawing level with 26 minutes on the clock. Martin Donnelly, who had twice been denied by fine saves from Shane Harrison, turned provider this time. His corner from the right was met by Jeff Hughes and the former Northern Ireland International headed home at the front post. Statistician Marshall Gillespie highlighted it marked a first Irish Cup goal for Hughes in Larne colours since finding the net in 2005 against Dungannon Swifts. The senior side continued in their search to take the lead, going close on a number of occasions, but had to wait until the 65th minute to get their noses in front. From a corner, Hughes took aim only to see his shot blocked by Star defender Ciaran Burns. Despite protests, referee Shane Andrews pointed to the spot. Up stepped David McDaid and he hammered past Harrison into the top left corner of the goal. The visitors looked to be tiring in the closing stages but Devlin still had to be alert to turn away an Aiden McNeill cross from the left. Victory was assured on 90 minutes when McDaid was in the right place to tap Lee Lynch’s cross home from six yards out. Larne: Devlin, Sule, Ramsey, McEleney (McNally, 14), Kelly, McDaid, Donnelly (Tear, 90), Tilney (Scullion, 81), Lynch, Cosgrove, Hughes. subs (not used): Dougherty, Stuart, Hassin, Igiehon. Crumlin Star: Harrison, Pigent A.McNeill, Hawkins, Burns, J.McNeill, Halfpenny (Murphy, 65), Trainor, Doyle (Chines, 86), Lyons, McKervey (O’Neill, 78). Subs (not used): Forbes, McIlkenny, Mullen.